I have been very into various Bibles lately. There are just so many different study Bibles that capture my attention. Some capture my attention in a negative way. 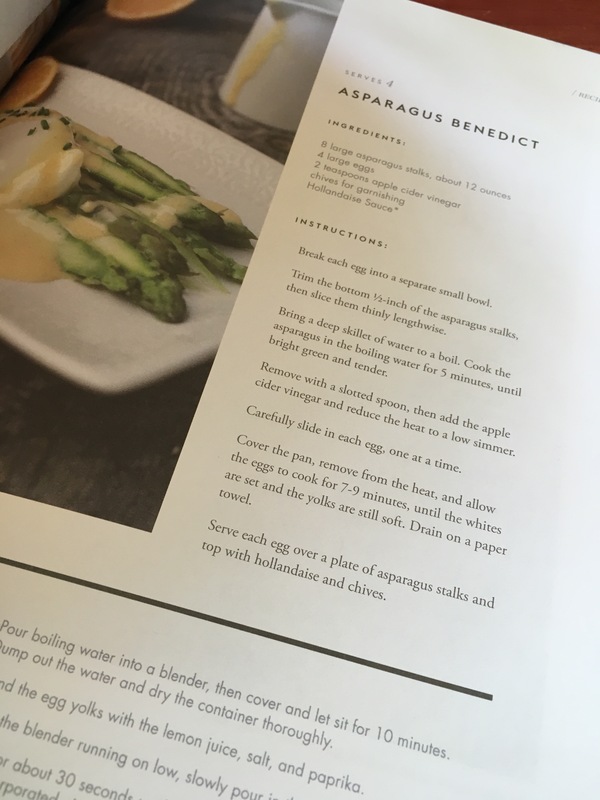 “Why would anyone make that study Bible? !” But most capture my attention in a positive way. 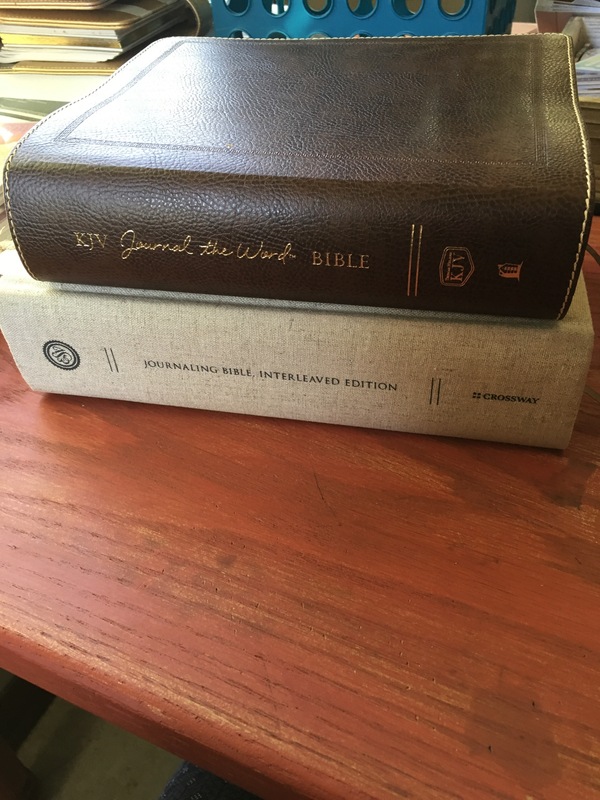 So, I’ve been picking up a few here and there to read through, use in my own personal devotion time, and see what my thoughts are on these various study Bibles. 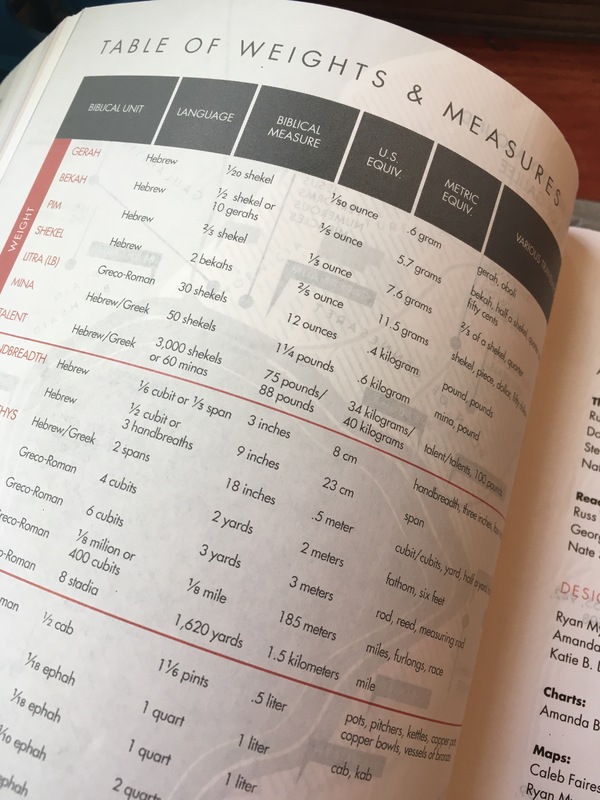 The Complete Jewish Study Bible caught my attention. I grabbed a copy of the hardcover edition, but there are fancierleatherversions. This hardcover is a shiny, glossy cover, but it is really good quality. Just for aesthetics, I like the color and the intricate stained glass patterns they use throughout. And guys- two sewn in bookmarks! That makes me really happy. I’m still waiting for a Bible to come with three. One for the Old Testament reading, one for the Psalms, and one for the New Testament reading. The Pastor wants 4- Old Testament, Psalms, Gospel, and Letters. The font is easy to read and in single column format. The margins are very narrow and not really suitable for writing in. 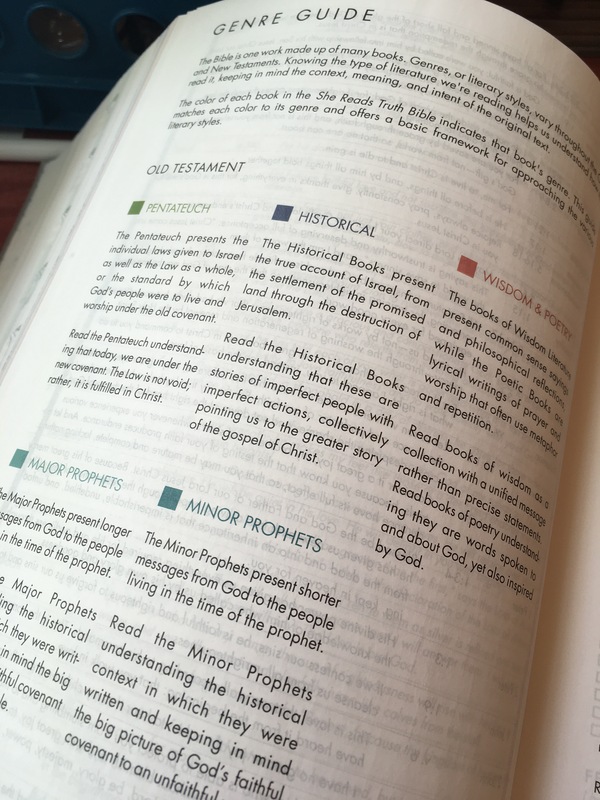 This Study Bible is packed full of useful study tools and information. I’m not the intended audience for this Bible. However, I have really liked this Bible. It has helped me see God’s Word in a new light. It has given more life and deeper meaning to things I’ve been reading my entire life. It has been a challenge to use, but it has made me slow down and really study the Word and not just breeze right through it. This won’t be the Bible for everyone, and I will get to that later, but it is an excellent study Bible. 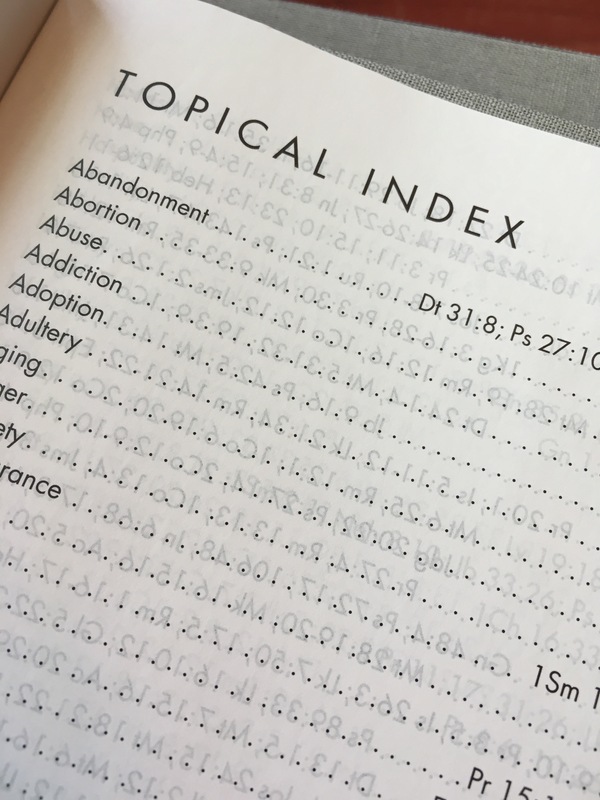 The first issue to note is that this Bible is not in our typical English order. It still begins with Genesis and ends with Revelation, but it is not in the same order in between. You have the Torah first (Genesis, Exodus, Leviticus, Numbers, Deuteronomy). Then you have all the prophets together (Joshua, Judges, Ruth, Samuel [1st and 2nd], Kings [1st and 2nd], Isaiah, Jeremiah, Ezekiel, Hosea, Joel, Amos, Obadiah, Jonah, Micah, Nahum, Habakkuk, Zephaniah, Haggai, Zechariah, and Malachi). Followed by the Writings (Psalms, Proverbs, Job, Song of Songs, Ruth, Lamentations, Ecclesiastes, Esther, Daniel, Ezra-Nehemiah, Chronicles [1st and 2nd]). In the New Testament, you have the Gospel first (Matthew, Mark, Luke, John), followed by Acts, then you have the letters broken into three categories; Letters to Communities (Romans, 1 Corinthians, 2 Corinthians, Galatians, Ephesians, Philippians, Colossians, 1 Thessalonians, 2 Thessalonians), Pastoral Letters (1 Timothy, 2 Timothy, Titus, Philemon), and Messianic Letters (Hebrews, James, 1 Peter, 2 Peter, 1 John, 2 John, 3 John, Jude). And then you end with Revelation. If you’re not used to this, you’ll have to just use the table of contents as you acclimate to the order of the books. Next, you’ll likely notice that you don’t recognize the names of the Bible. The aim of this particular translation was to restore the Jewishness of the Bible. So the names of the books have been taken back to their Hebrew names. No worries, though. The English names appear on the right hand pages with the Jewish names on the left. I also found I didn’t know any of the people or places in the Bible! Those got put in Hebrew, as well. I actually really appreciated this. It made me read it a little outside of my language. It also had me noticing who was doing what a little bit more. And fortunately, they included a handy Glossary of Hebrew (with pronunciations!) to English. So, I could look them up as much as I needed to. 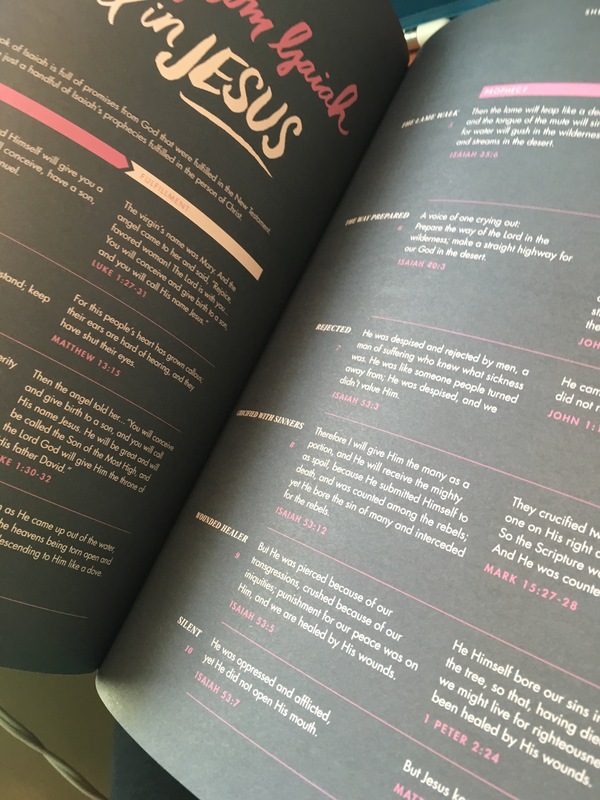 Each book of the Bible has a great introduction to bring you into the book, including an outline. It also goes ahead and tells you the main names and places in English so you don’t have to look them all up straight out of the gate. 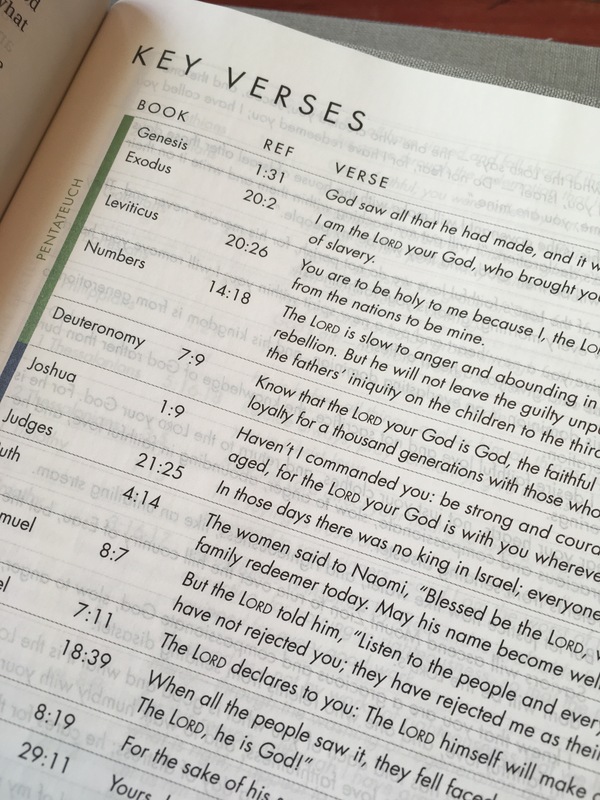 The Complete Jewish Bible also contains a great amount of introductory material. It tells why they translated it the way they did. It goes into translation issues. It brings up the vision and potential audience of the translation. They go into detail on why the Bible is God’s Word to humanity. It explains poetry, law, legalism, and more. It fully outlines the prophesy of the Messiah and how Jesus is the fulfillment of that prophesy. 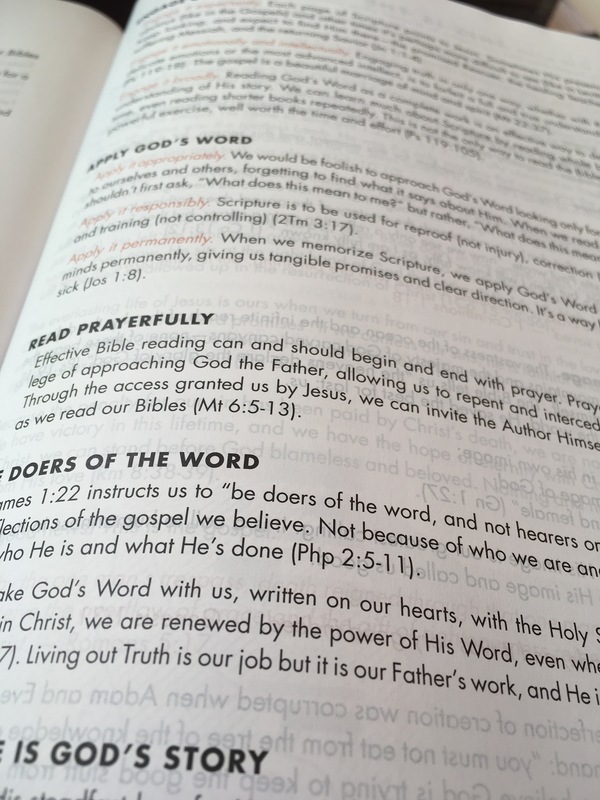 The introduction is almost a full book of great information to help as you study God’s word. Now, this Bible is not going to be for everyone. There are plenty of people who are about calf-deep in their walk into the river of God’s Word and this will just make them almost drown. If you were just stepping in and knew nothing of the Bible, this would be a fine place to start. No worries there at all. But there are people who are not yet fluent in the Bible but are getting there. This is going to overwhelm those people. People completely non-fluent in Scripture and people very fluent in Scripture will find something amazing here. But those middle people may need to get a little more comfortable with The Word before diving into something like this. I’d hate for anything meant for good to be a stumbling block. This Bible is very much of the scholarly side of things. This is not about life application or practical application of doctrine. 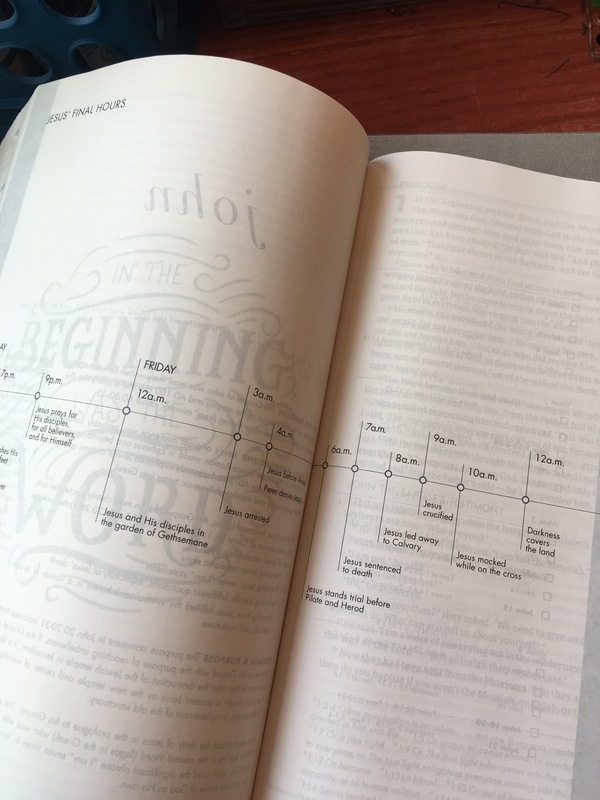 This Bible helps you understand the world into which Jesus came into and the world the Jewish people came from. It brings you back into those Hebrew roots so you are better able to read the stories and the words more in their context. It is an extremely eye opening experience. This Bible is packed full of even more features than I’ve listed. Articles from Jewish scholars. Information of Jewish customs. There is just so much here. 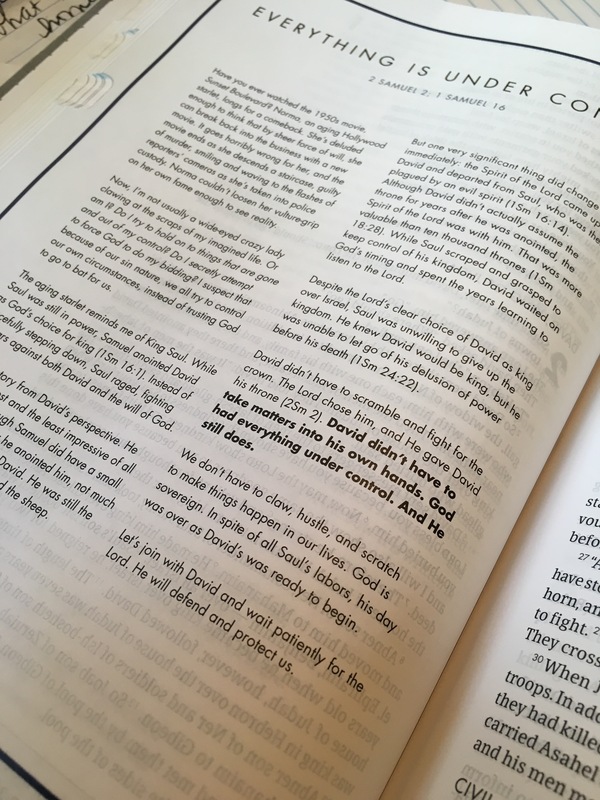 It also has footnotes that describe the culture of what is going on within the Scriptures. I will definitely be hanging onto this Bible. It makes the Scripture new and fresh. It brings to life deeper meanings. It brings more understanding of Jewish faith and culture. And all along the way, you can see Jesus woven throughout. It just highlights those threads of grace so we see the shadow of the cross stretching across the entire span of man’s history. I might be a little bit of a Bible fanatic. 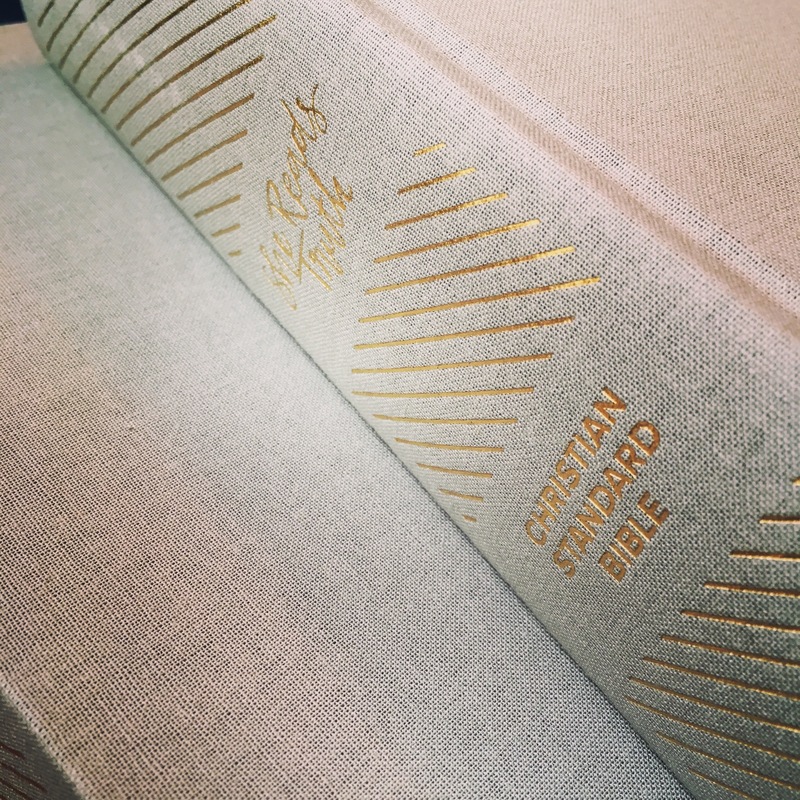 I am always looking at the new Bibles coming out soon and admiring them. 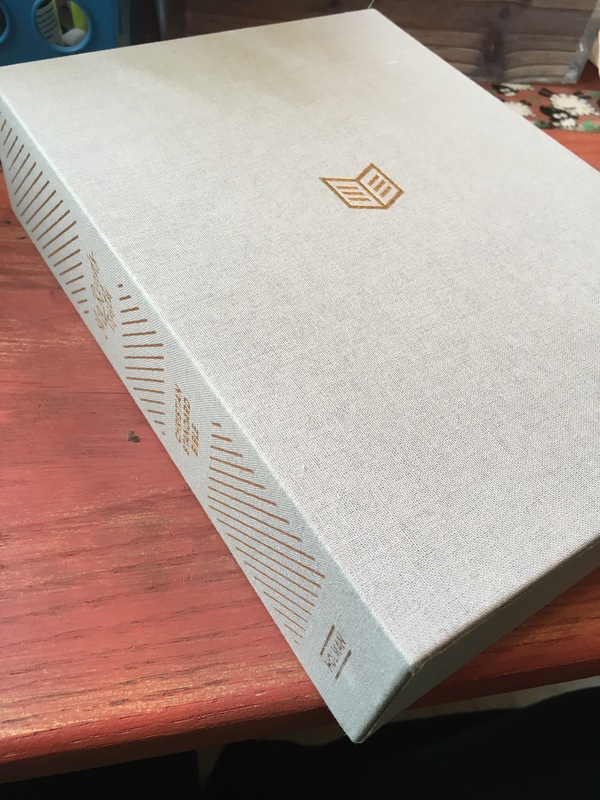 When I saw that Crossway was releasing the ESV Illuminated Journaling Bible, I was immediately obsessed. All the pictures just looked so beautiful! I couldn’t wait to get my hands on it. Just know the pictures don’t even come close to capturing the beauty of this Bible! 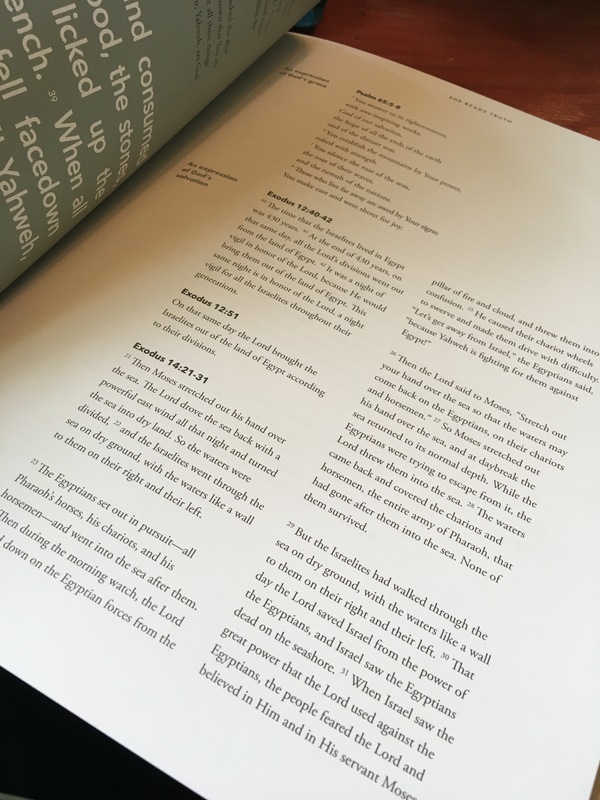 Crossway made this Bible in 4 editions. This is the green hardcover version. You can also get a burgundy imitation leather or navy blue cloth bound hardcover. They also had a black topgrain leather version that is no longer available. 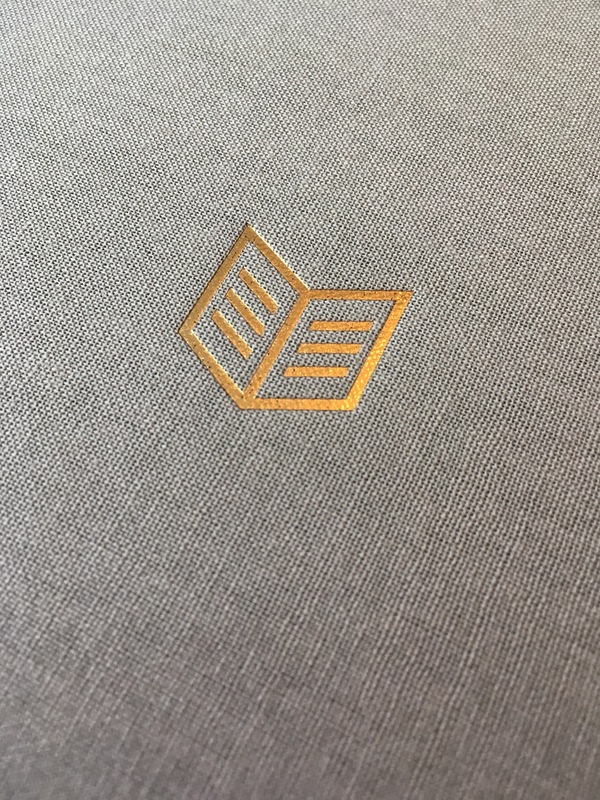 And yes, they all feature the beautiful gold patterns on the cover. The green hardcover, this one, has a book jacket. The other three have a slipcase box. I’m honestly never a fan of either and both end up getting tossed in my house. 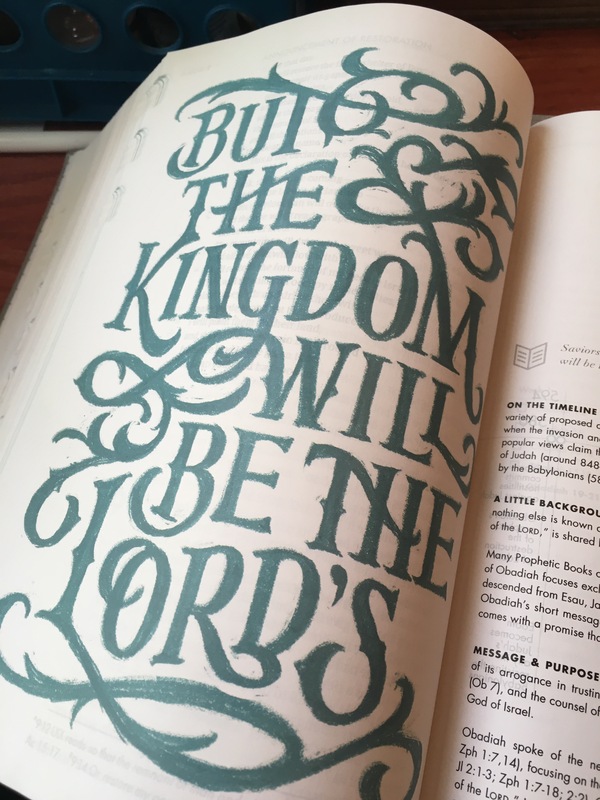 Each book of the Bible has a beautifully illustrated title page. Every illustration in this Bible is shiny gold. 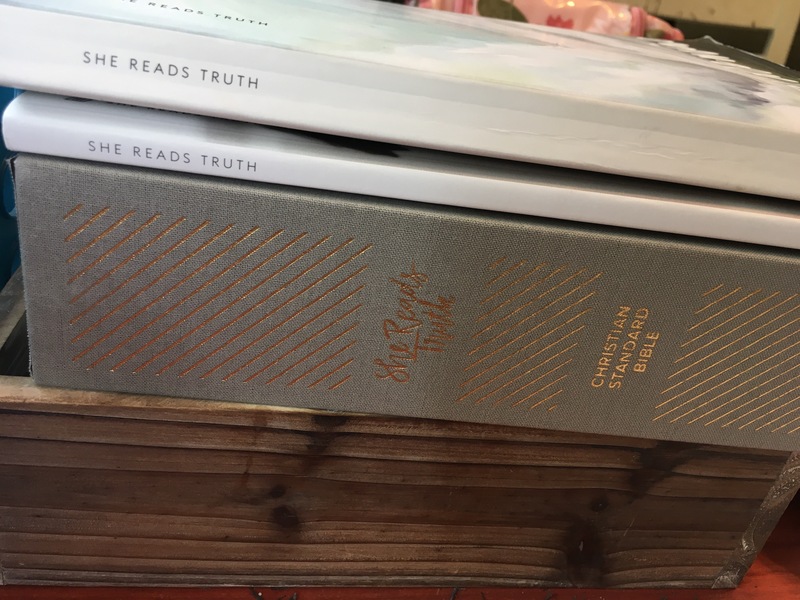 It is a best of both worlds kind of journaling Bible. It already has beautiful, finished illustrations. But it also has plenty of room to add your own illustrations or notes. As you can see, there is a bit of ghosting in the margins. 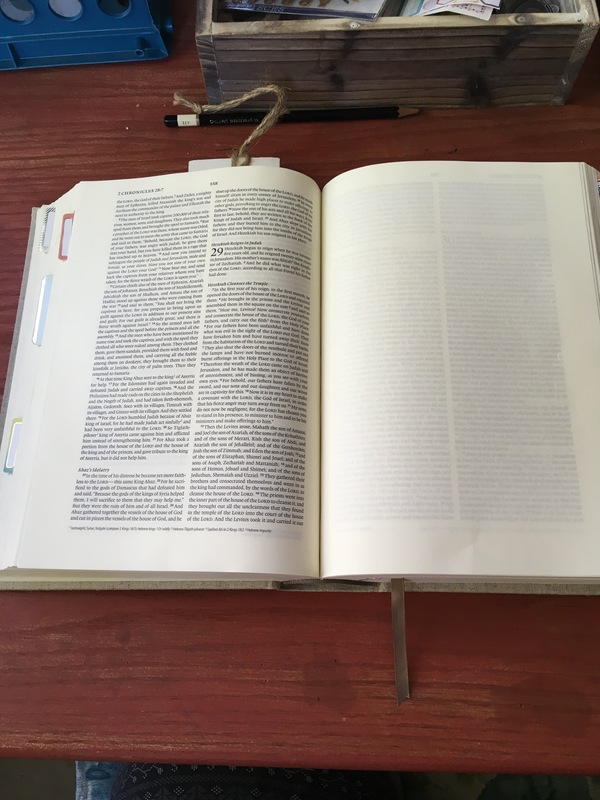 The paper is thick for Bible paper, but it is still Bible paper. It is thick enough that you don’t have to be precious about which highlighters you use. 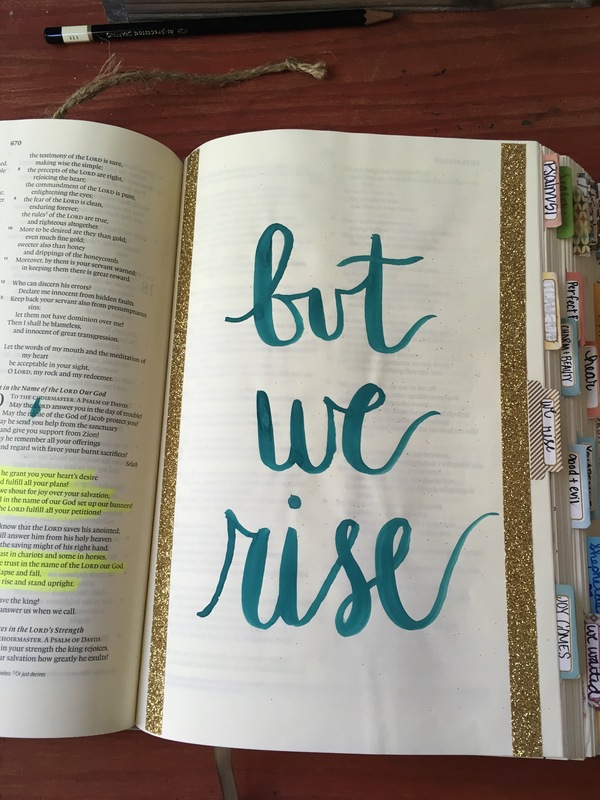 I find Crossway journaling Bibles to be thick enough to color and even paint on. It just takes a little practice getting your paint thin enough or your paper prepped so it won’t bleed. 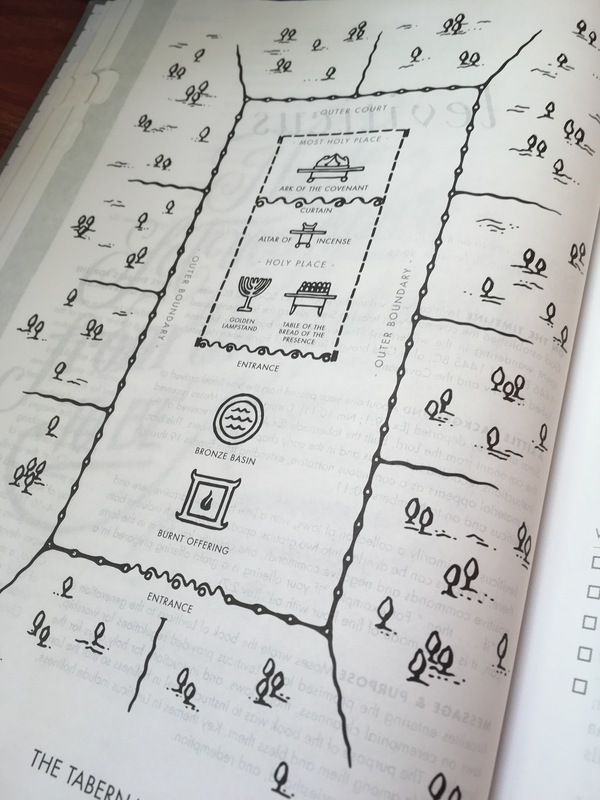 There are small illustrations in the margins throughout the Bible. They are all so pretty. 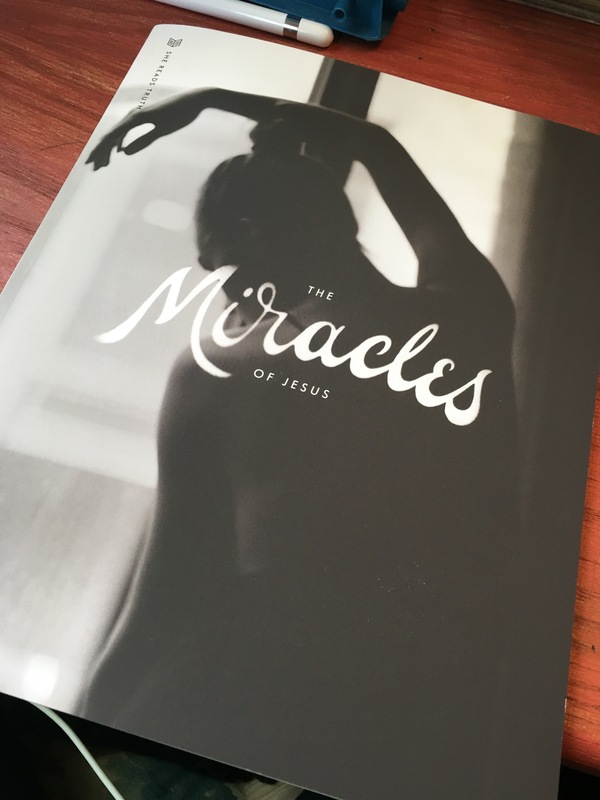 You could leave this Bible on your coffee table just to flip through, it is so lovely. You can see that even though it is full of beautiful gold illustrations, there is still room to add your own doodles, art, and notes. 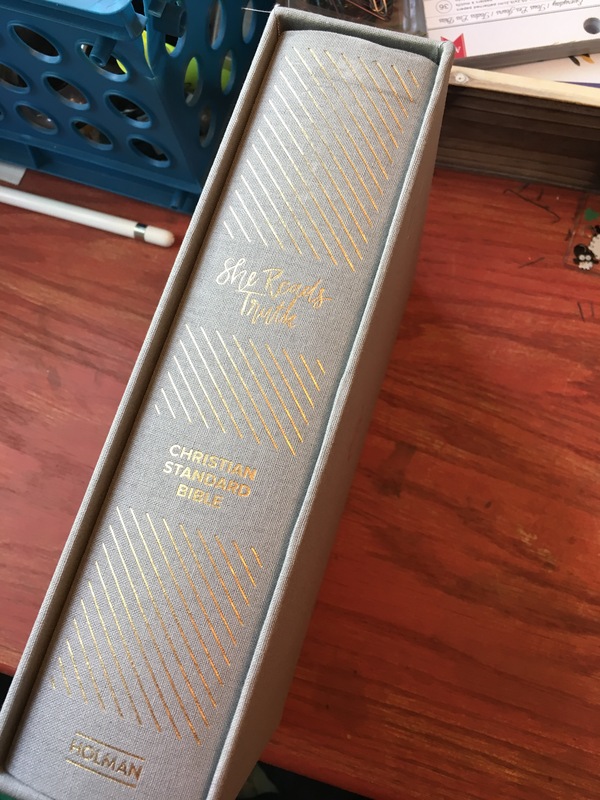 The margins are completely blank, but I still think this would make an excellent Bible for someone who wants a beautifully illustrated Bible, but is more of a note taker. 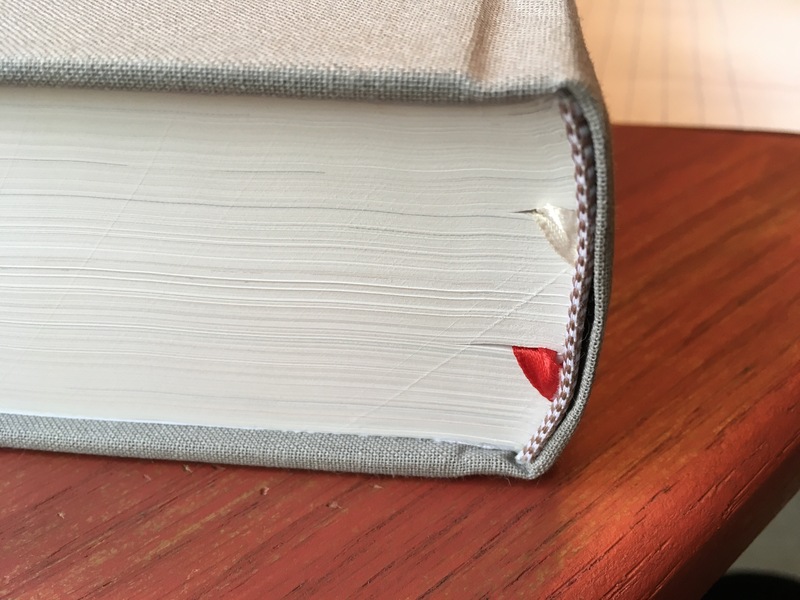 You can also see that the pages lay pretty flat. 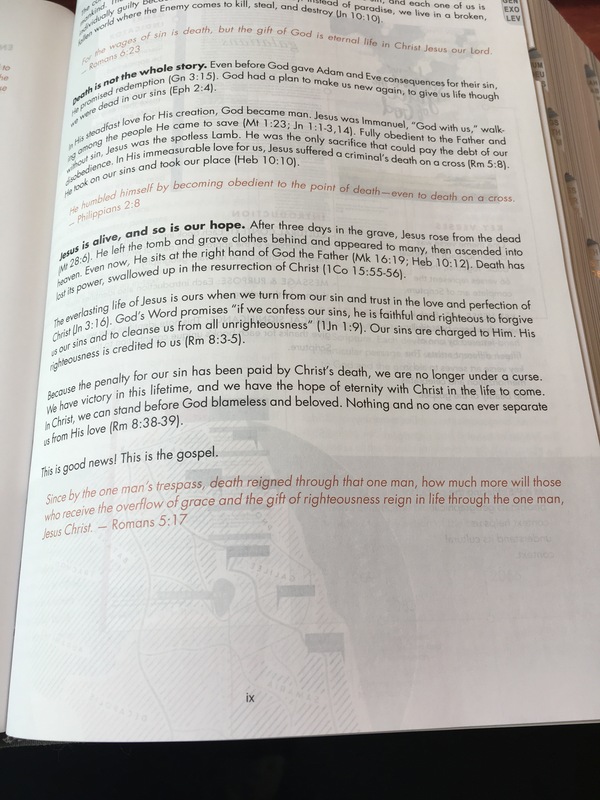 Really, the only “extras” in this Bible are these pages at the end (there are more than pictured) that have pictures of each book’s cover page and a brief explanation of the art you see there. I would absolutely love to have these as art prints to frame on the wall, but there are so many! But they are so beautiful! I just want them out where I can see them all the time. 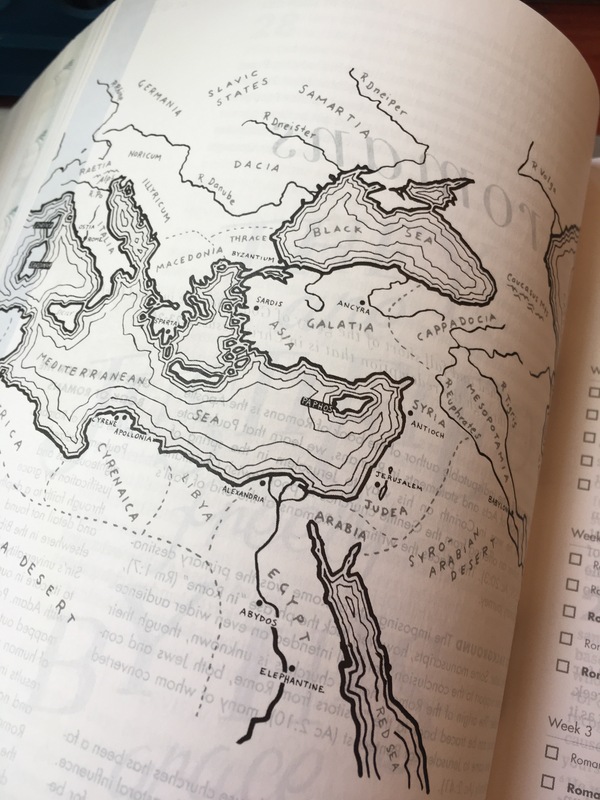 But there are no maps, no concordance, no topical studies. 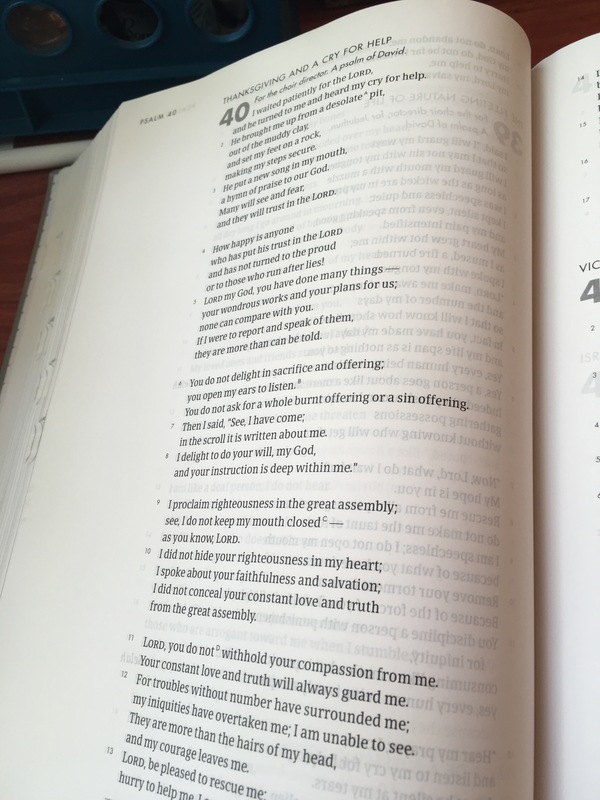 This is just a single column ESV Bible text with wide margins and lovely gold illustrations throughout. Very simple. Very beautiful. 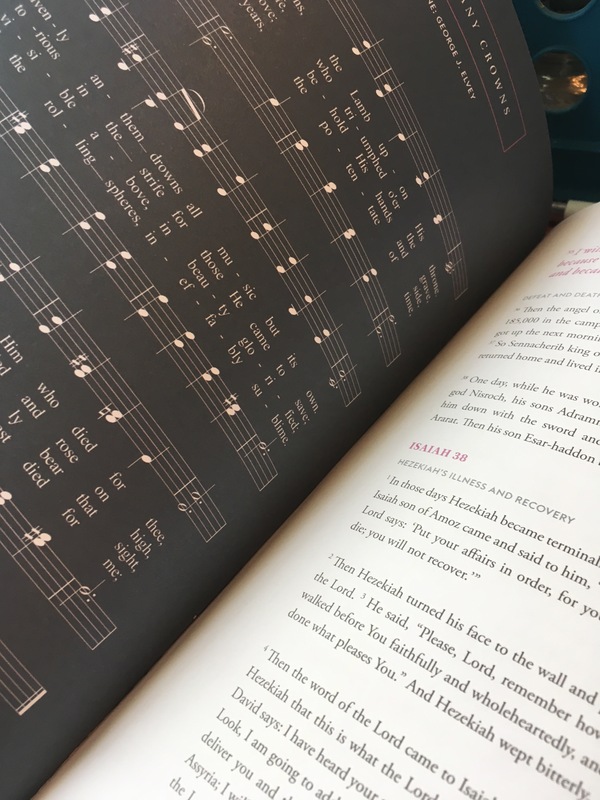 This Bible ended up being so much more beautiful in person than I imagined, which was a difficult task because everything I had seen was amazingly beautiful. 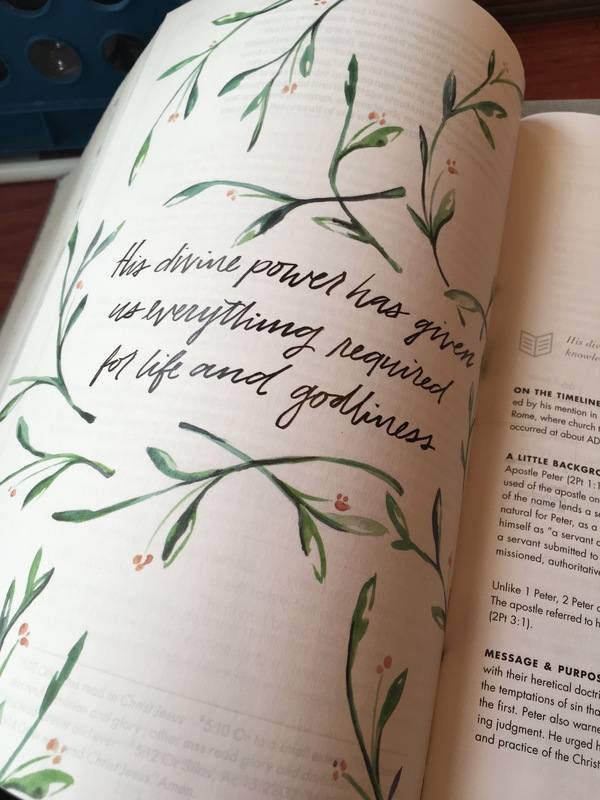 The Illuminated Journaling Bible is just so beautiful and such high quality. This is just another great way to fall in love with God’s Word. 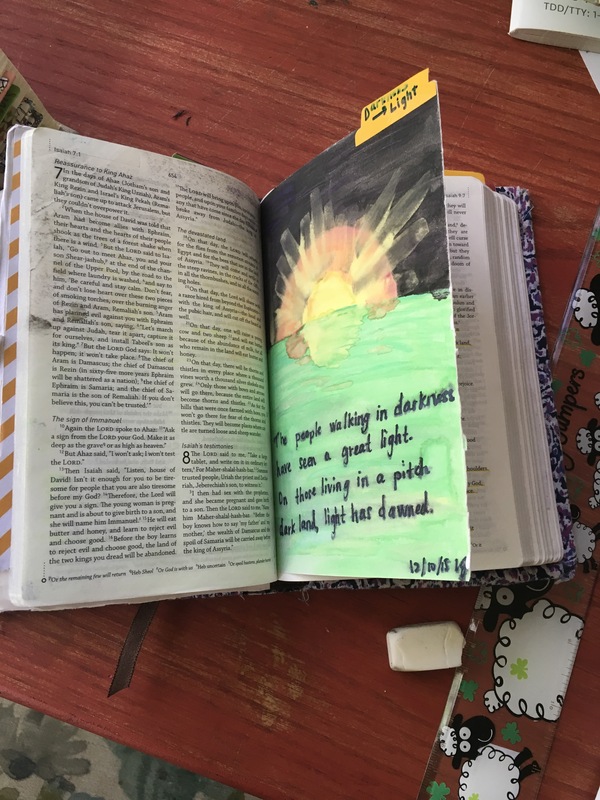 Bible Journaling can be a great way to get in God’s Word on a more regular basis and change the way you interact with it. 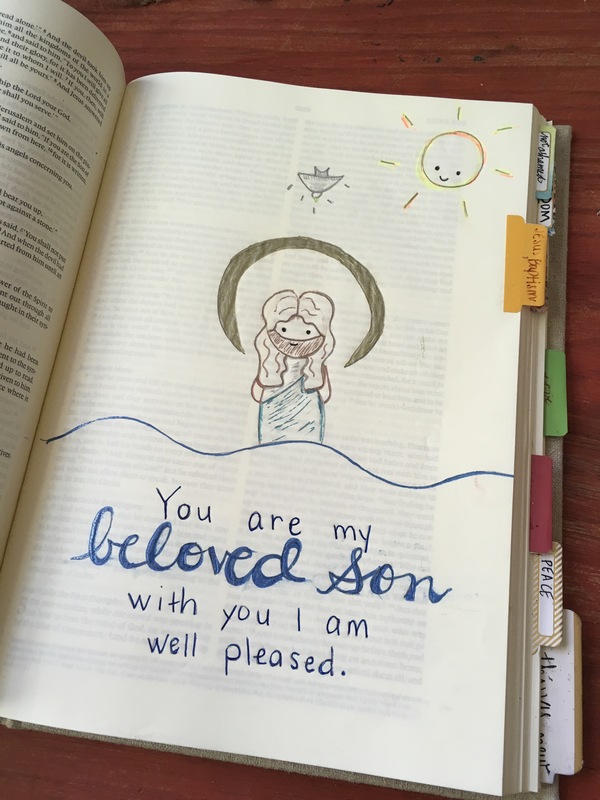 Artistic skills or not, you can Bible Journal and you can get a lot out of it. 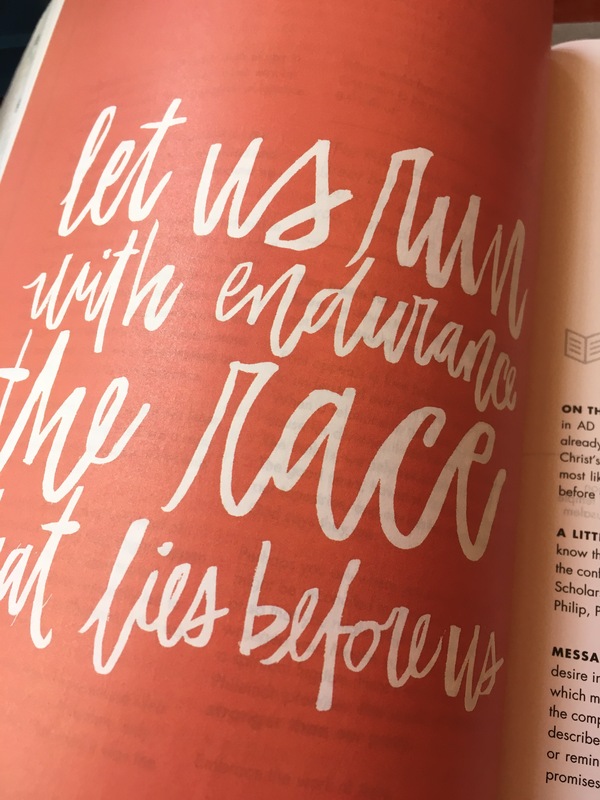 If you have a hard time remembering to read your Bible daily or if you are just in a rut with Bible reading, you may way to seriously consider using Bible Journaling to rekindle your love of The Word. 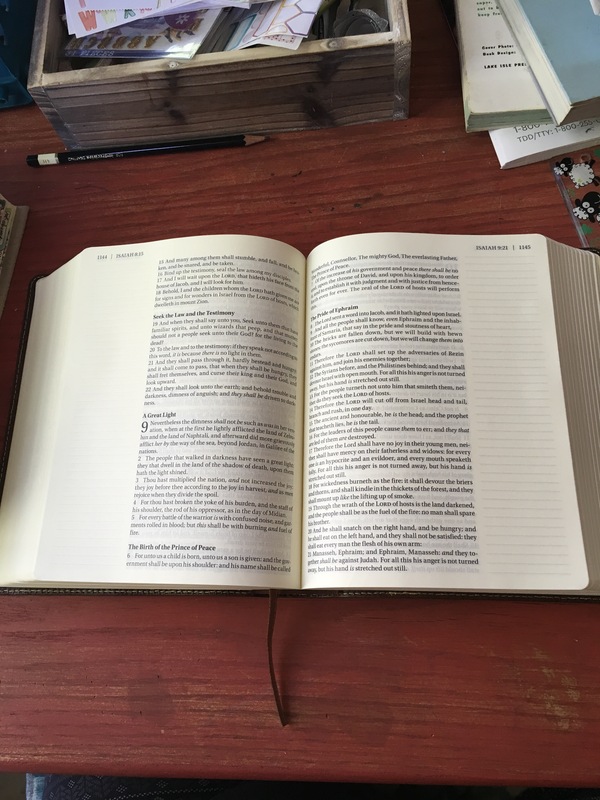 There are many different journaling Bibles on the market. I have found that CBD.com offers the biggest selection for the cheapest price. There are single column versions, double column versions. Some with space to write or doodle at the bottom of the page. Some have doodle space to the side margin. Some have every other page blank. You’ll find many different versions available. Which one is best for you depends on you. 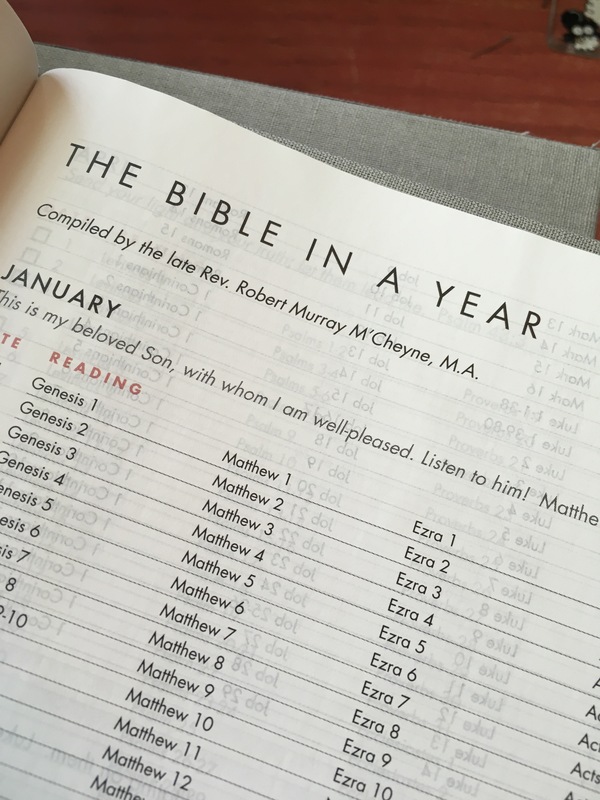 Do you have to have a Journaling Bible to Bible Journal? Well, no. Not at all. 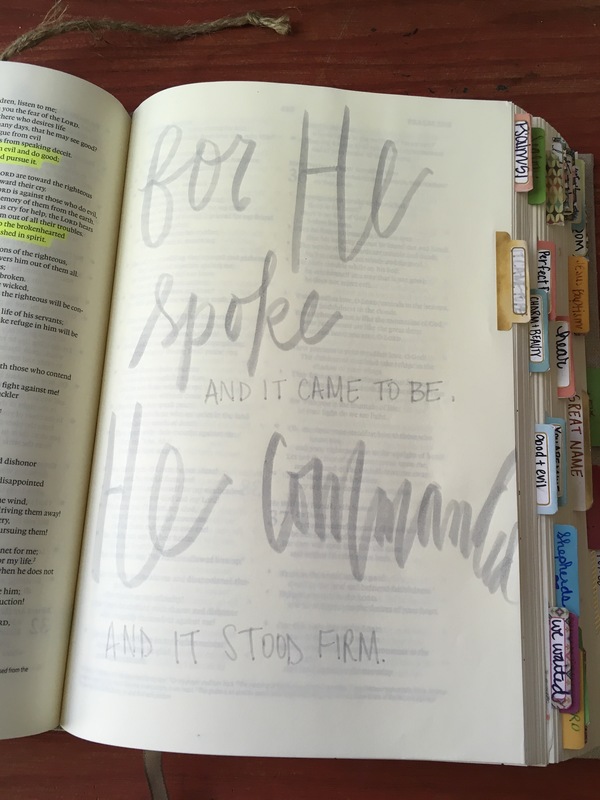 You can journal the Word in other ways. But a Journaling Bible is nice to have. 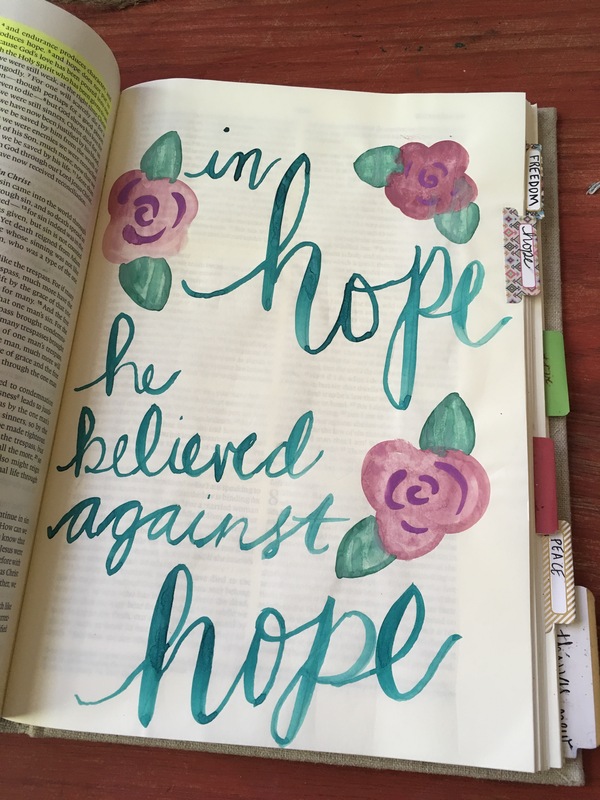 You’ll find many examples of Bible Journaling pages on Instagram looking under the hashtags #illustratedfaith #biblejournaling #icolorinmybible. 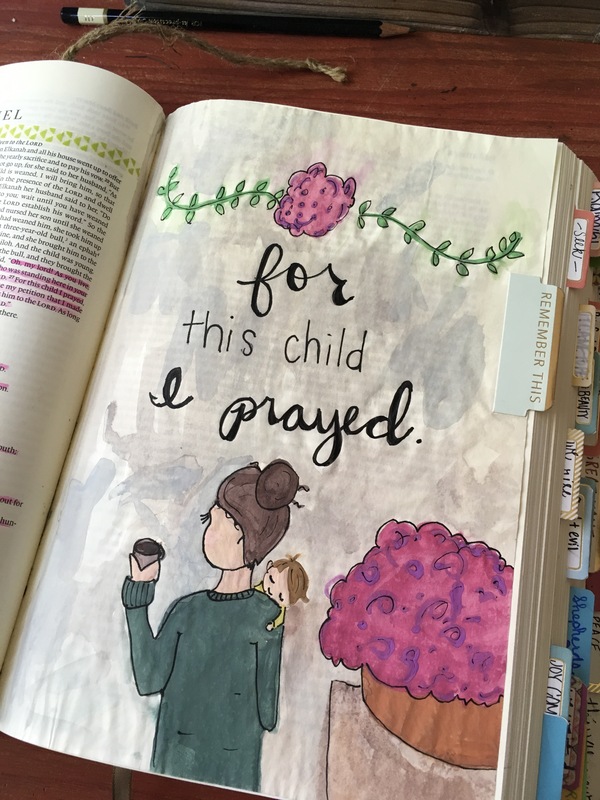 You will also find plenty of inspiration on Pinterest, searching for Bible Journaling. 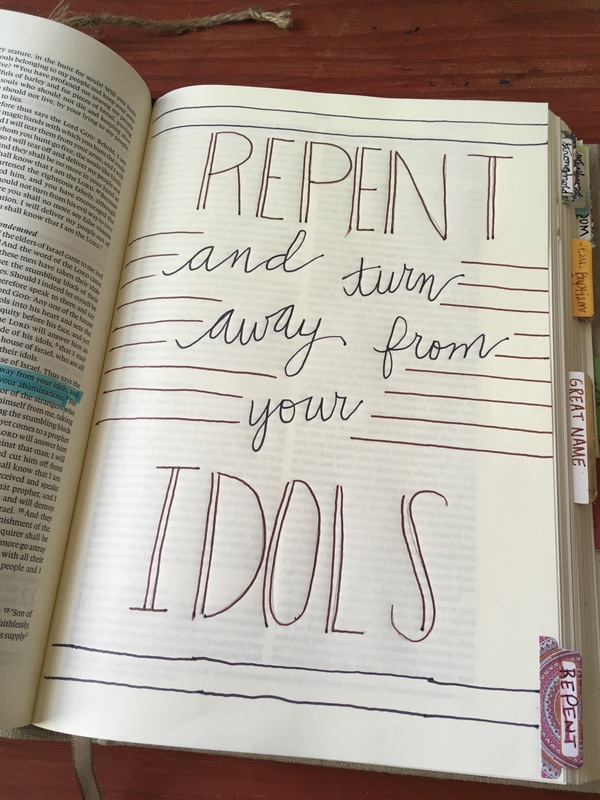 Some people draw, some letter, some do more of a scrapbook thing, some buy or download prints to trace or to paste into their Bible. Some people like to play around with multiple methods. 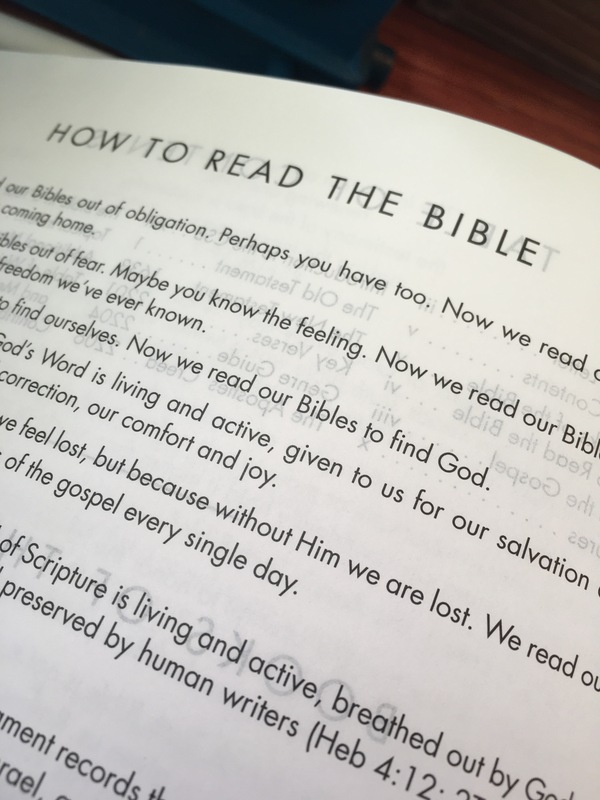 You’ll find that some people are okay covering the Bible text, while others like to keep all the text readable. What you decide is really up to you. But make sure that whatever you choose, it is about you saturating yourself with the Word and not just about trying to make something cool. Not every journal entry I make turns out awesome. Sometimes my ink smudges. Sometimes I just don’t like the result all that much. But that is okay. The end results are what it is all about for me. The process is where it is at for me. Reading Scripture, finding a verse that speaks to me, taking that verse and carefully lettering it so it sinks in good and deep. That is what I am working toward. Interacting with God’s Word. The results are just pretty proof and a good reminder when I flip through my Bible. 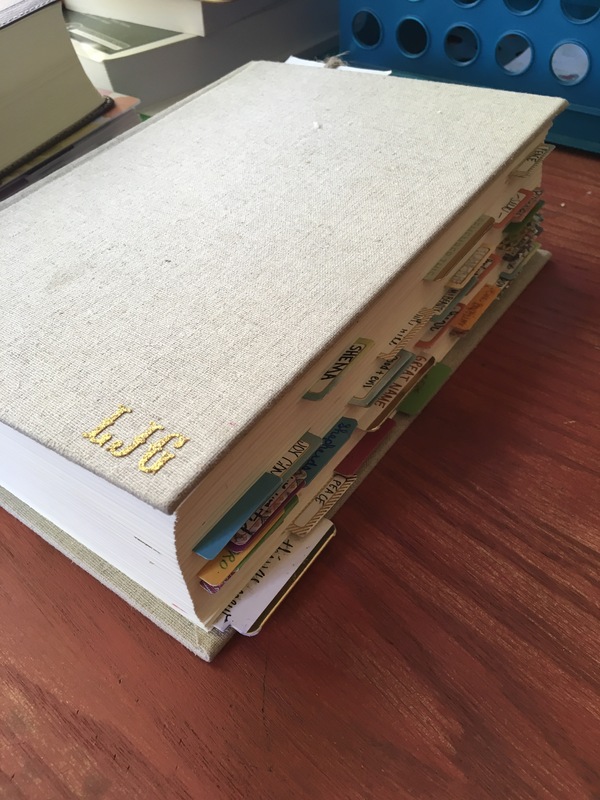 My journaling Bible is quite hefty. 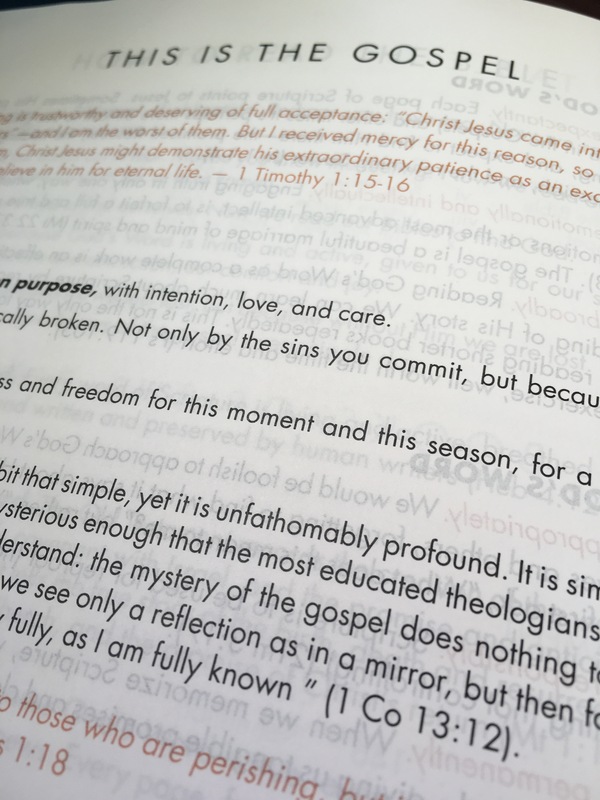 I chose the Crossway ESV Interleaved version. 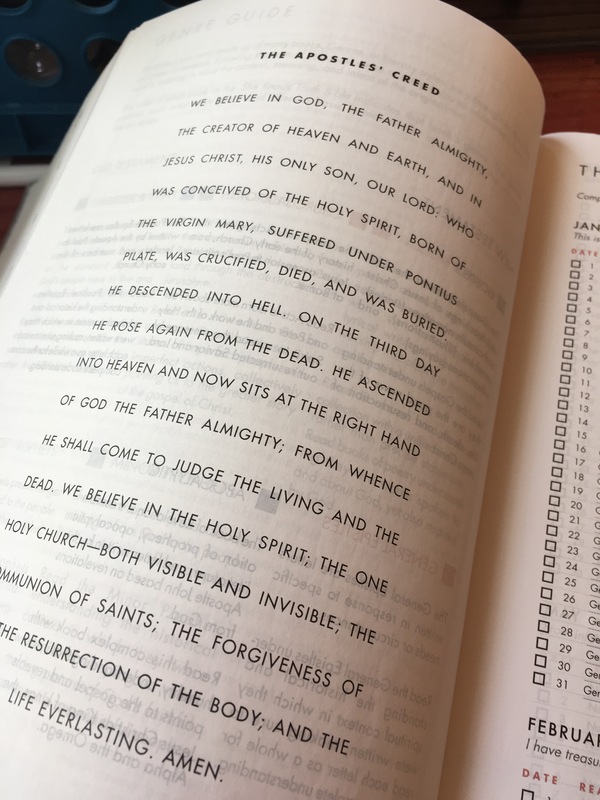 So every other page of my Bible is blank. That makes for a very thick book. For that reason, it pretty much stays at home. I have another Bible that I keep in my bag for church and reading while I am out. It sounds very first world to have multiple Bibles. And it took me a long time to allow myself permission for this little luxury. But I have now given myself permission, and I am glad that I did. I don’t necessarily journal every day. Right now, I am, because I am working through a #letteringhislove challenge on Instagram. These types of challenges help me shake things up. 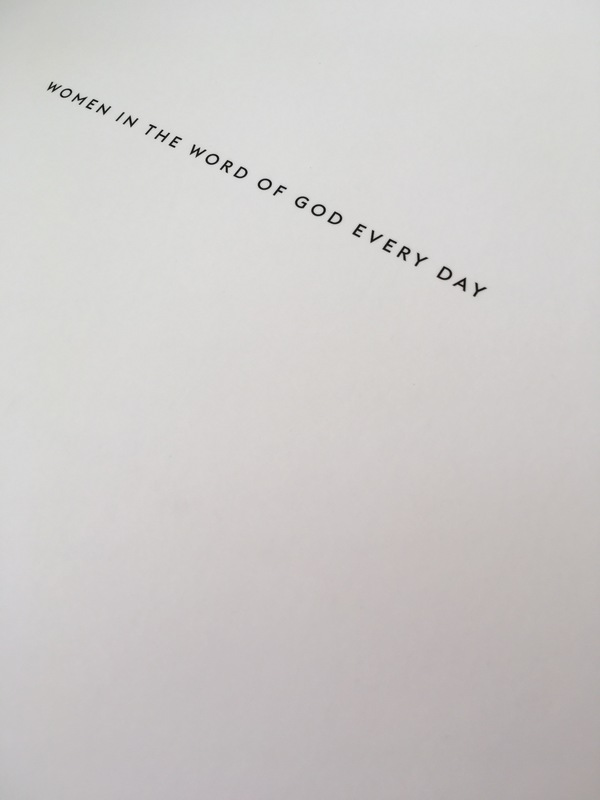 I do read the Bible daily, but I don’t always have the time to devote to making a journaling page. 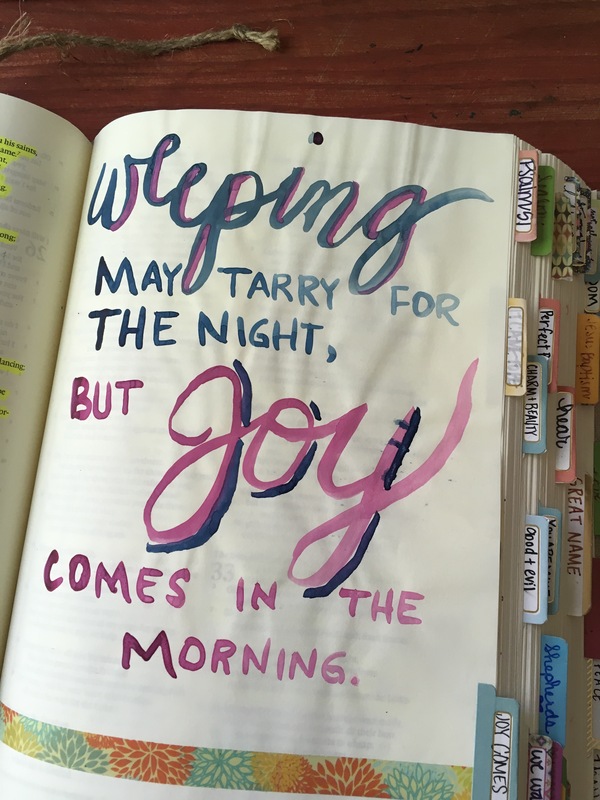 It is never quite when I do my Bible Journaling or my devotions, for that matter. Quite is not something I get in my house. I do get time to sit and work on it. I might be interrupted a few dozen times. Some people like to put on music. I grab a cup of coffee or a glass of tea and sit and enjoy God’s Word. Sometimes a kid will join me at the breakfast table and work on their own art. My tween likes to make pages to tape into her Bible. Music isn’t always possible because someone may be watching Teen Titans or Paw Patrol in the next room. That is okay for me. 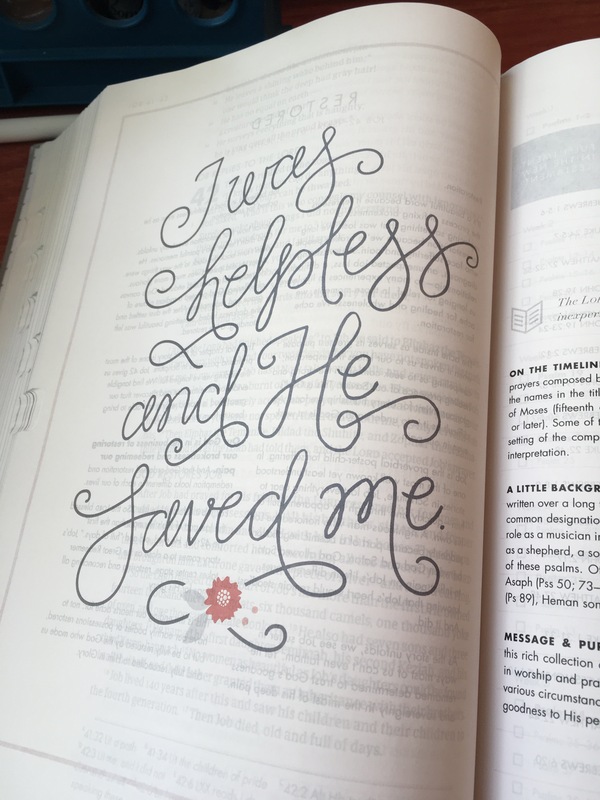 My favorite tool in Bible Journaling is my Tombow Calligraphy Pen. I find it does lettering so beautiful and deep black. I usually do a quick mock up on a piece of notebook paper, then use a pencil to lightly draw my basic lettering onto the page. I then go over the pencil with my Tombow Calligraphy pen. 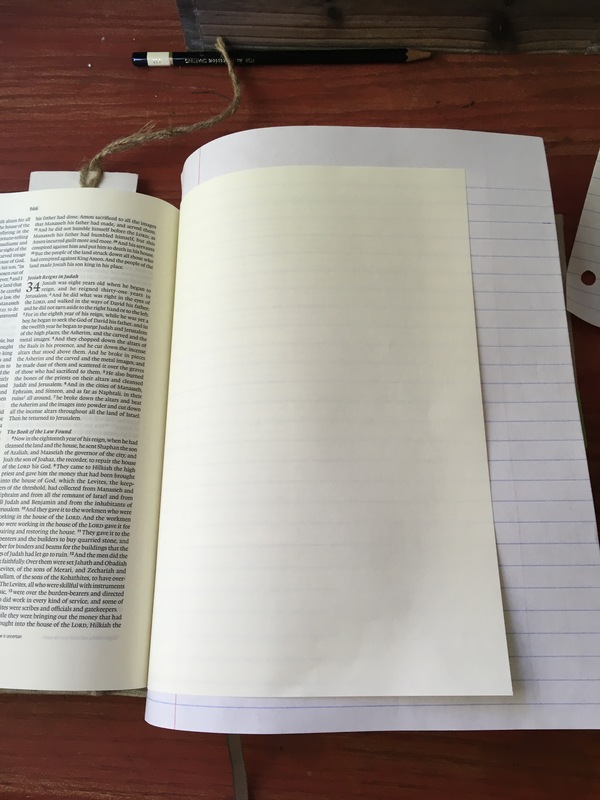 To keep my words straight, I put a sheet of lined notebook paper under my Bible page. It gives faint lines I can follow without me having to mark the page with lines that then have to be erased. It is also helpful when I am using things that might bleed through. I have tried the Tombow Dual Brush Pens. I thought I would love them. Turns out, I don’t. Maybe I would like some of the colors, but the black and gray that I have are just not all that impressive. 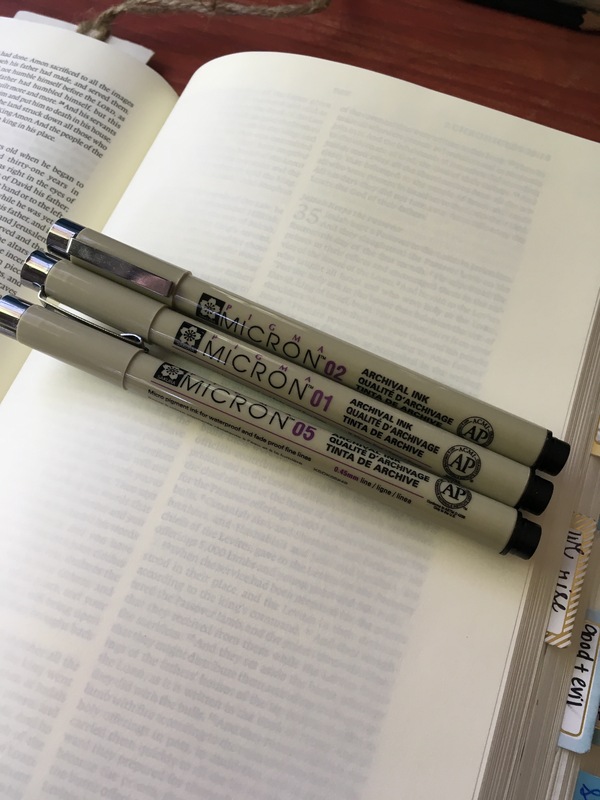 Pigma Micron pens are also great for Bible Journaling. I find the thicker ones (05 and 08) are best for me. But the smaller ones are great for tiny details. Water brush pens and watercolors are also excellent art supplies to try. The water brush pens keep you from using a huge amount of water in your work, so it doesn’t wrinkle the page as much. I have also used regular brushes and watercolor, and have liked the experience despite the page wrinkle issues. Dr. Ph. Martin’s Bombay ink is my all time favorite art supply. 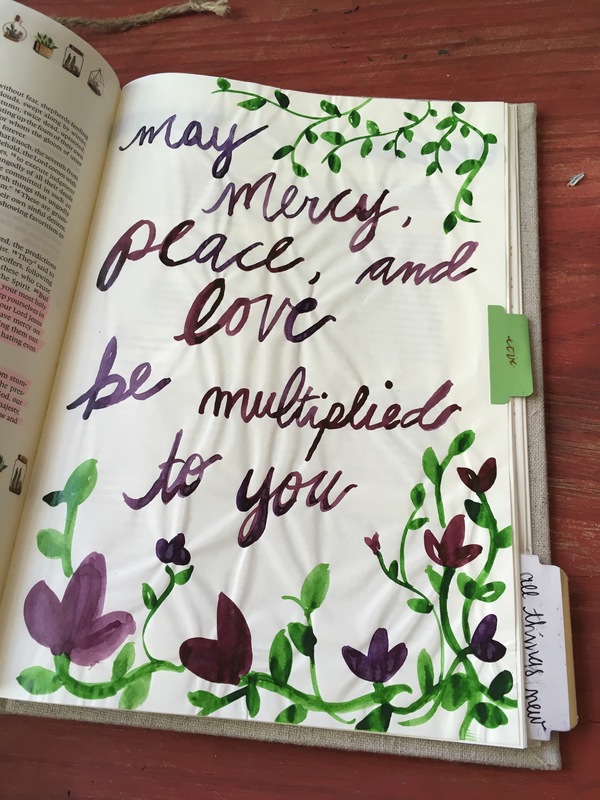 Unfortunately, it isn’t really best with Bible Journaling, due to the thin pages. 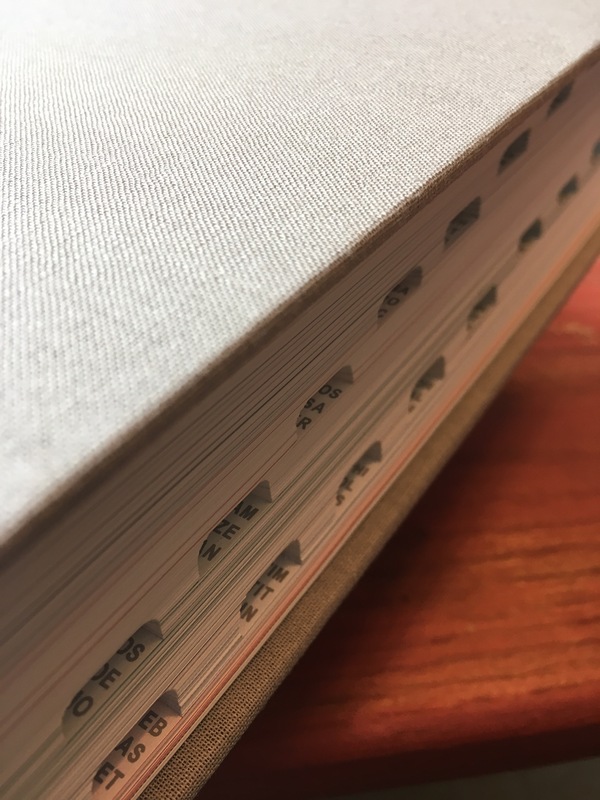 If you want to use something that isn’t great on thin paper, you can always use it on better art paper and then use double sided tape, washi tape, or even a glue stick to glue it in. 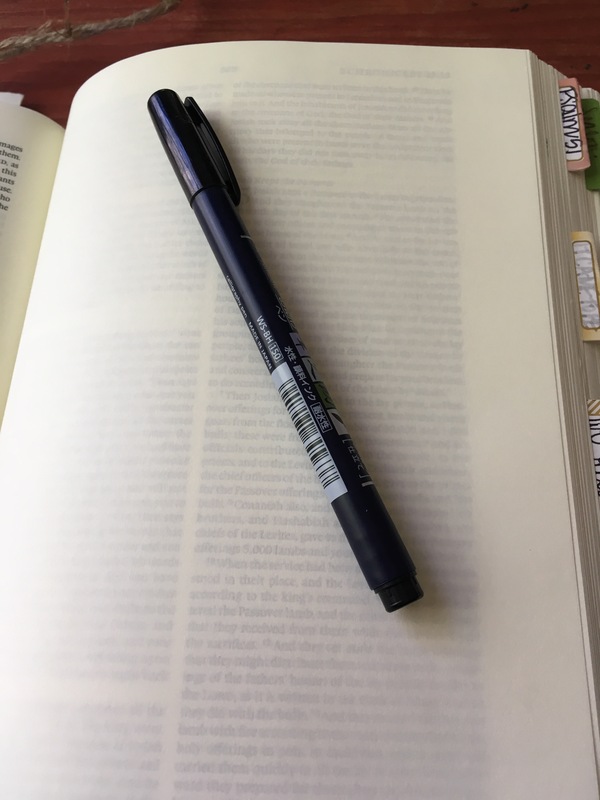 I usually leave my Bible open to dry after I am done, but if I need to close it, I just stick another sheet of ruled paper on the top and close it. With very wet watercolors, this isn’t the best idea. But once everything is close to drying, or you used pens, it is fine. I also have a love for washi tape. 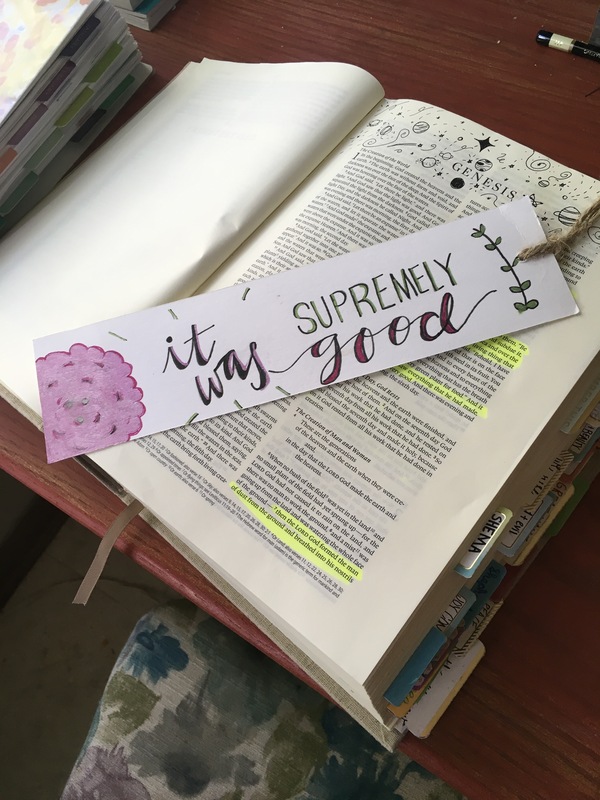 I use it to decorate my Bible book headers. I also use it to add some accent to pages. I use stickers, as well. Decorative paper can also be fun to work with and add in. I like to tab my artwork pages. I have used a few different kinds of tabs, but the Recollections sticker tabs from Michael’s are my favorite tabs. They are a really good size and they stick well. 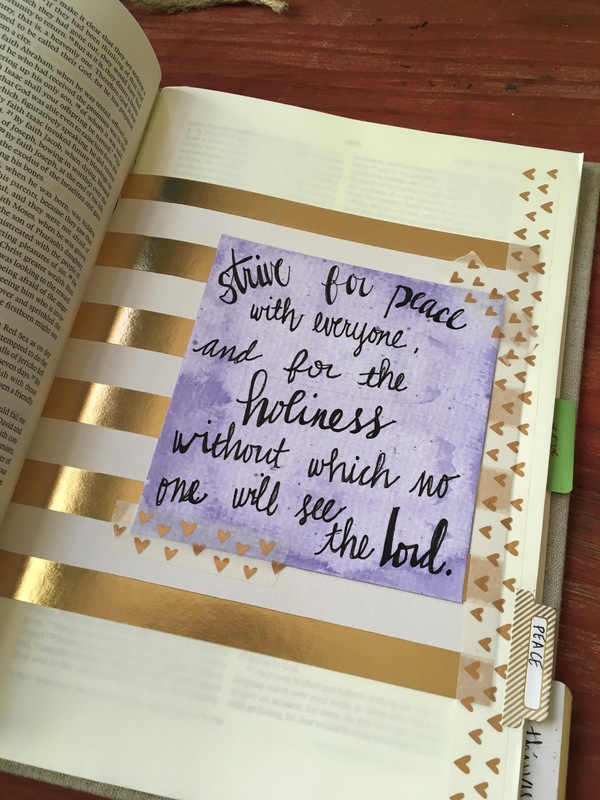 Gel pens, colored pencils, acrylic paints, watercolor colored pencils, stamps, and stencils are all good tools to use for Bible journaling if you like them. You can also add decorative paper clips, bookmarks, really anything you like. 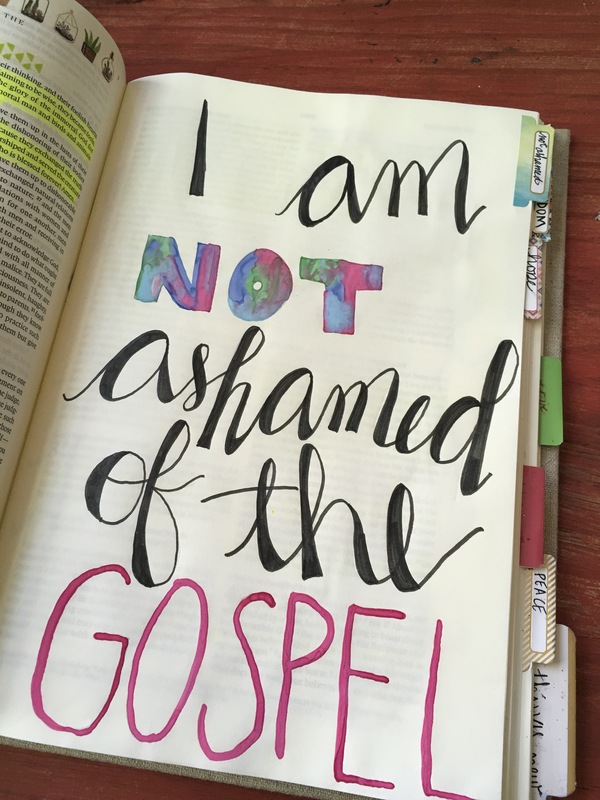 I have seen some people Bible Journaling with just a pencil to sketch lovely drawings. Use the supplies you like. 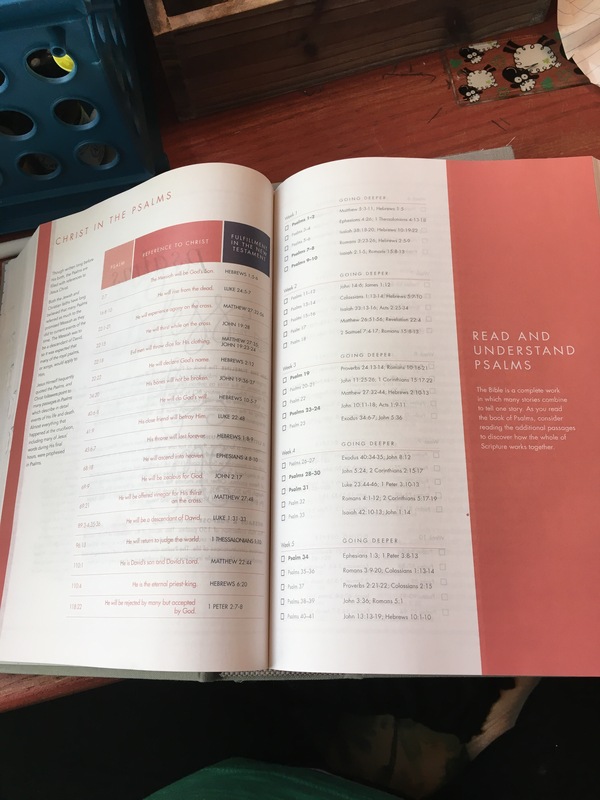 You can use the title page or table of contents page as a test page to see what your tools are going to actually do on the Bible style paper. If you’re not quite sure about going the Journaling Bible route, you can always just keep a notebook of your art. 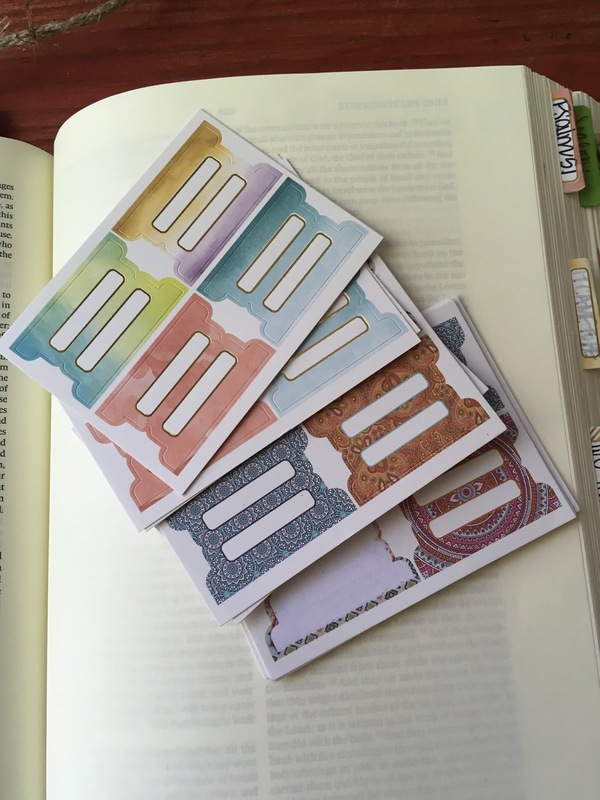 Bookmarks are another way to begin Bible Journaling without committing to writing or drawing directly in your Bible. 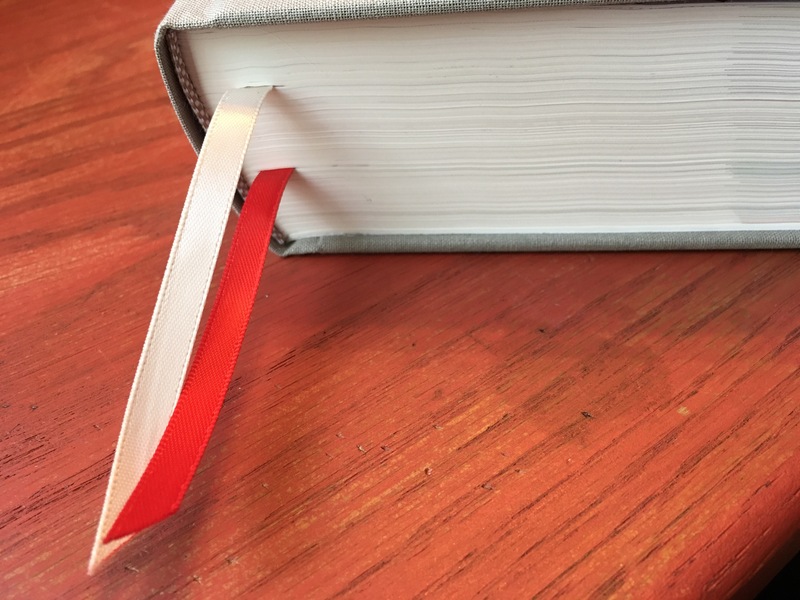 Another method would be to use double sided tape to tape pages into your Bible. 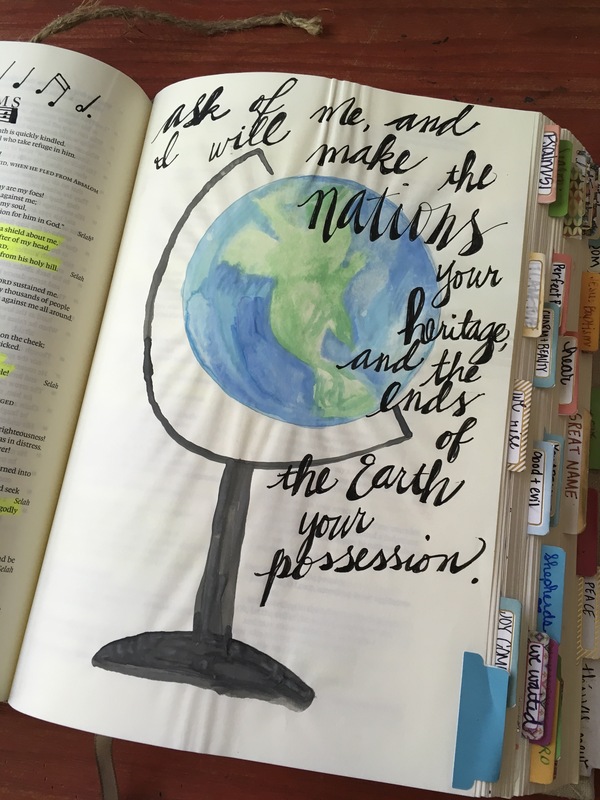 I did this for a few months before I decided to buy a Journaling Bible. If you are not really wanting to create the art yourself, you can buy a Coloring Bible or a Bible Coloring Book. 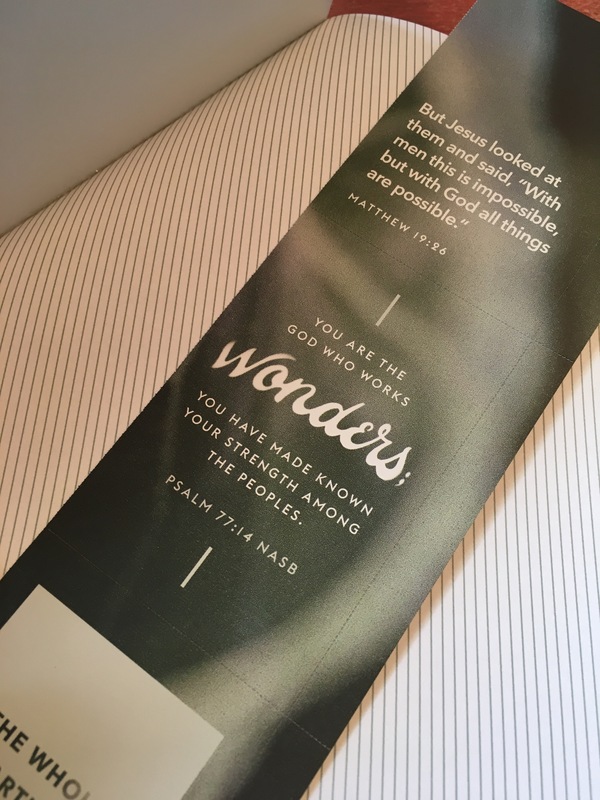 There are also several people on Etsy that sell Bible Journaling templates you can use to trace or glue into your Journaling Bible. 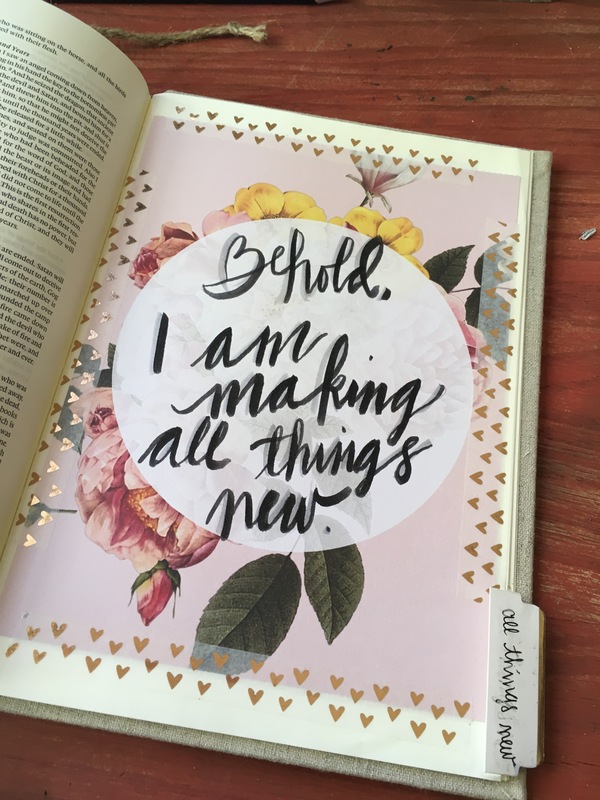 You can scrapbook your Bible, if that is more your thing. Really, anything that gets you into the word and interacting with it in new ways is going to be a good thing. So, where do you start? Start with your favorite verse. Start with a Psalm or Proverb. Start with a Bible Story you can illustrate. Start wherever you are currently reading. 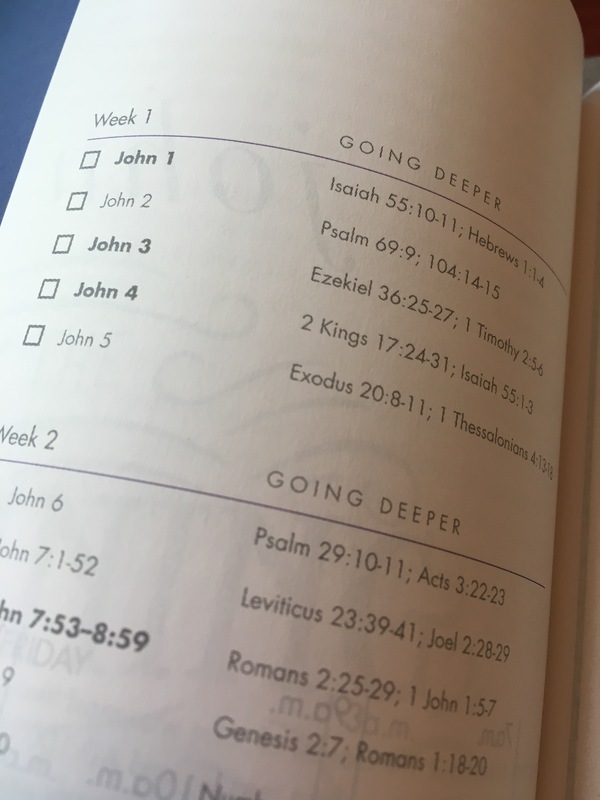 Start with adding one entry to each book of the Bible. Just get started!